This page may take up to 1 minute to load depending on internet speed. Click on each of the pictures on the left to see the installation of the adapter in-between the air filter assembly and the carburetor. The process is similar for most engines. The engine shown is of the foreign/metric design and uses stud extenders. All American/SAE type carburetor adapter kits will include two new longer studs with the kit. Instead of adding an extender, each stud is removed and a longer stud is installed to add the 1-1/4" of additional length needed. Accessories are included to extend the crank case vent tube and any additional holding bolts as needed for each specific engine type. Before installing the adapter between the air filter and the carburetor. Remove air filter assembly exposing the two studs that hold the carburetor. Stud extenders are screwed on over the existing studs on metric type carburetors. American type SAE carburetors will have new studs that will extend the threads out to the same length as shown. The adapter is slipped over the studs and the air filter assembly is reinstalled. 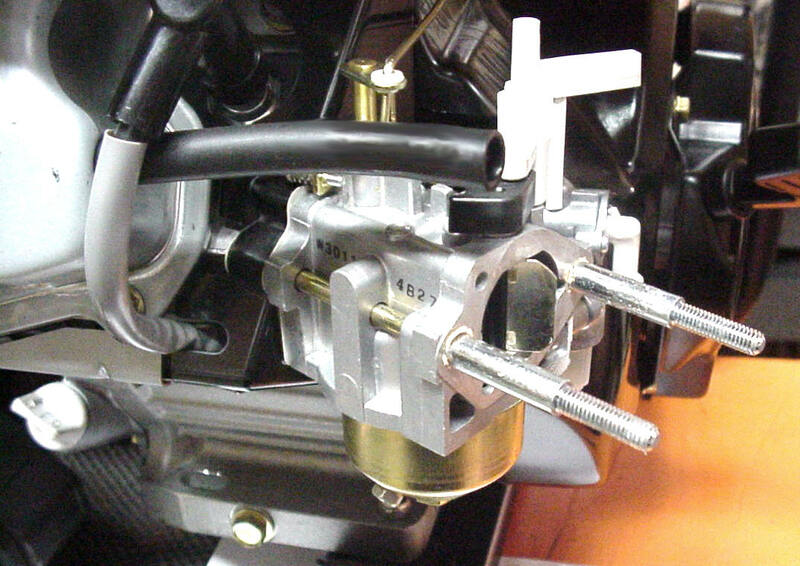 The engine regulator is installed near the carburetor and on some engines there will be additional accessories included in the kit like the crank case extender tube shown above the carburetor. Complete installation shown with 20# propane cylinder. After the kit is installed going from gasoline to propane or natural gas is as easy as turn off the petcock on the gasoline tank and connecting a propane cylinder or using a rubber hook-up hose and quick disconnect to connect the generator into the home gas pipe system.